Stanley Thompson spent a great deal of time designing and building courses in cottage country during his career and the list is not a short one: Allandale, Big Bay Point, The Briars, Cedarhurst, Couchiching, Eastbourne, Mardon Lodge* and Orchard Beach surround Lake Simcoe. Muskoka hosts Bigwin Island*, Huntsville Downs, The Sands née Muskoka Beach, Muskoka Lakes, Norway Point* and Windermere. Owen Sound, Saugeen and Wasaga Beach* round out the List. *Some do not exist any more or have been radically altered over the years and most began life as 9 hole courses later to be expanded to 18. For you diehard Stanley fans, Allandale is a course that should be near the top of your “must play at least once” list. Allandale’s claim to fame is that the course is ostensibly the same today as the day it was built back in 1927. No fake man made mounding or over grooming here, just towering trees, small greens and a bunch of really good golf holes. 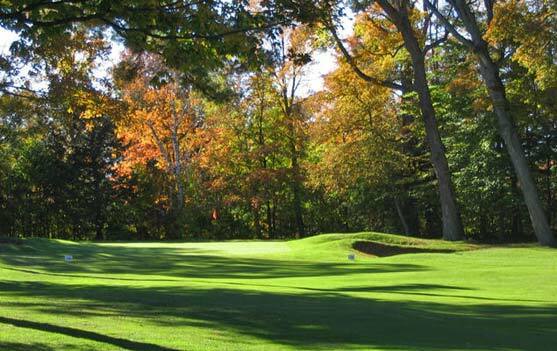 The Stanley Thompson Society claims that it is one of the few Stanley courses that is still true to its original design. Although only 9 holes, as soon as you are finished you will want to march right back over to the first tee and do it all over again! With the prevailing winds in you face and a gentile up-hill raise to the green, the last at Allandale plays every inch of its 525 yards. The landing area off the tee is fairly forgiving but massive trees will capture the errant drive. The putting service is protected by bunkers and over-hanging maples. The key to a happy finish is the placement of the second shot with the prudent player positioning the approach 100 yards out and left of centre, leaving and unobstructed pitch to any pin position. Attempting to reach this hole in two takes two pretty healthy wallops and failure means bunkers and trees making an up and down very tricky indeed.